Creating an online shop is not enough to make it profitable. You need to optimise the website to make it convenient and useful for visitors. 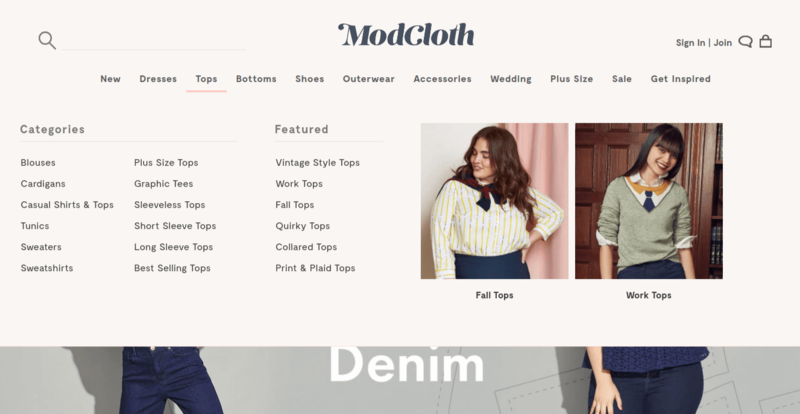 To help you understand the crucial features of e-commerce development, we formed 5 ground rules on how to improve your website. Product page aims to inform the customer and to encourage the purchase. Try to perceive the product page as a landing page, it should convert users to clients. Make it attractive and useful for the users, highlight key elements that will lead to the purchase. To optimize the page in the most effective manner, you have to understand the behaviour of the people. 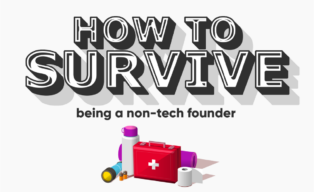 If you don’t have much experience in e-commerce, learn from those that already succeeded in this sphere. 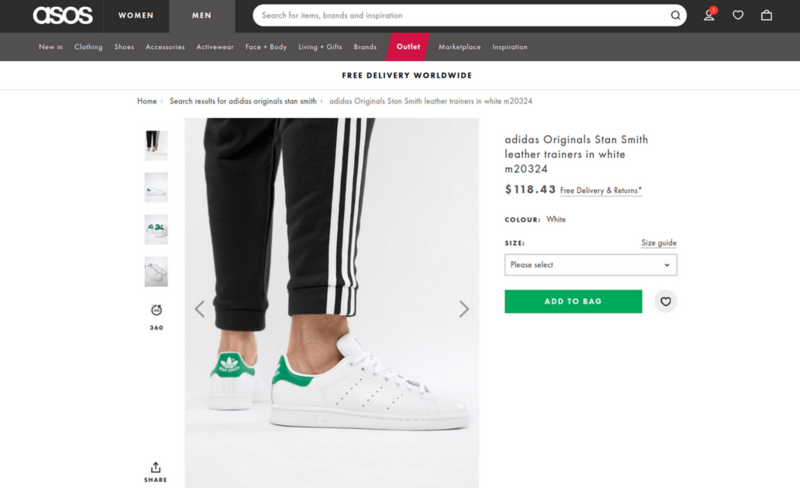 Here are some simple tips on how to optimize the product page and lead users in the right direction. Firstly, play with contrast. People’s eyes tent to pay attention to the elements that stand out. Draw the users’ attention to the parts that have the most value. Have a look at the 2 pages of the same product, but on different websites. Both pages seem to be ok. The product lays in the centre of the page, description, and CTA are on the right side. But what were the first things you saw on every page? On the first picture, we directly looked at the right corner, as there are located standing out elements: bold text and contrast CTA. This product page is optimized and accents are placed in the right places. Visitors can pay attention to the crucial selling elements. On the second picture, bolded elements are scratted on the whole page. So, it is hard to concentrate the attention on one part. Probably, at first, you focused on the red button of OUTLET and green CTA, as they attract attention the most. Here is the third version. We find it the worst option of the product page among those three. CTA and product description box merge with the background. This part is crucial, but it doesn’t attract attention. More contrast colours would do a better job. Also, it’s good to remove distractions from the page. Human’s attention is sensitive to the distraction. It takes us only a few seconds to decide whether to stay on the page. 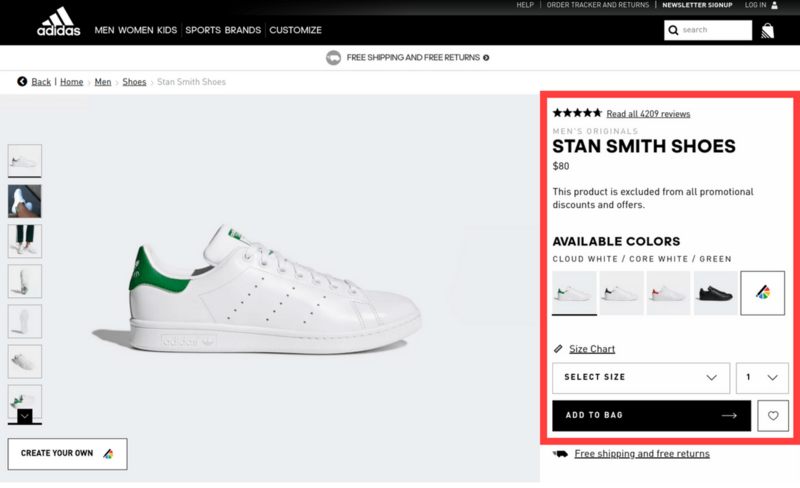 If the product page is overloaded with unnecessary details, we lose attention quicker. For example, some websites show ads banners on the page, which drag attention from CTA and interfere the purchase. Sometimes, because of this additional block on the page, CTA can sink out of the visible page area, as on the picture below. Note, how Topshop managed to include the most important elements of the product page. 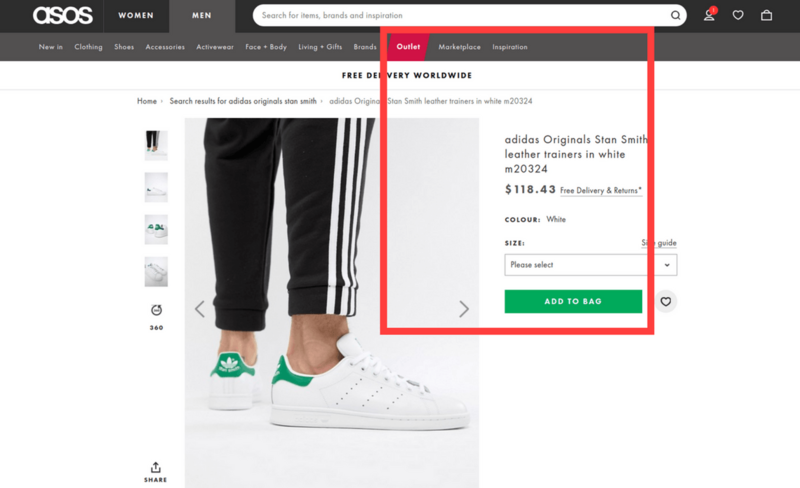 There is nothing superfluous on the page, just necessary information for buying a pair of shoes: Name, Price, Size, Quantity, Delivery options and button “Buy”. And all these elements are placed in the visible area. When visitors reach the website, it’s important not to lose them at this point. We want the website to be convenient, therefore navigation should be intuitive and clear. 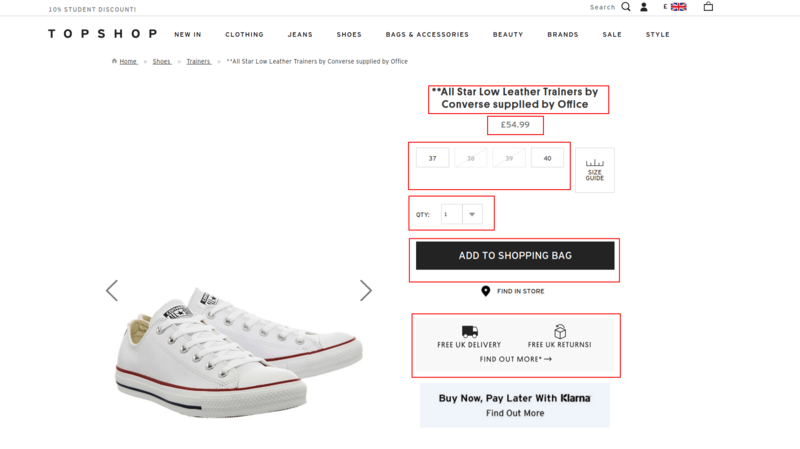 The main purpose of navigation is to lead users during the buying process, so we need to ensure a clear path from landing to the checkout page. Regardless of the entering page visitors have to find their way to the goal. An optimised website has to have an understandable structure. Important categories of the products should be presented in the main navigation, while minor categories can be located in the drop-down menu. 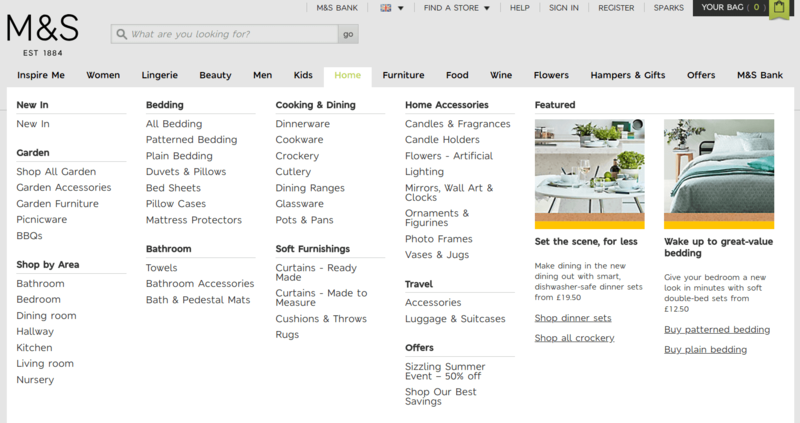 M&S has a more extensive product range, but its navigation follows the same pattern. The most important categories took place at the top, and the drop-down menu opens clear items divisions. This structure helps to guide navigation to the correct point. If an online shop has a diverse product range, it’s useful to develop advanced search with different filters. It ensures cleaner navigation through all items and visitors can find the needed product in shorter terms. 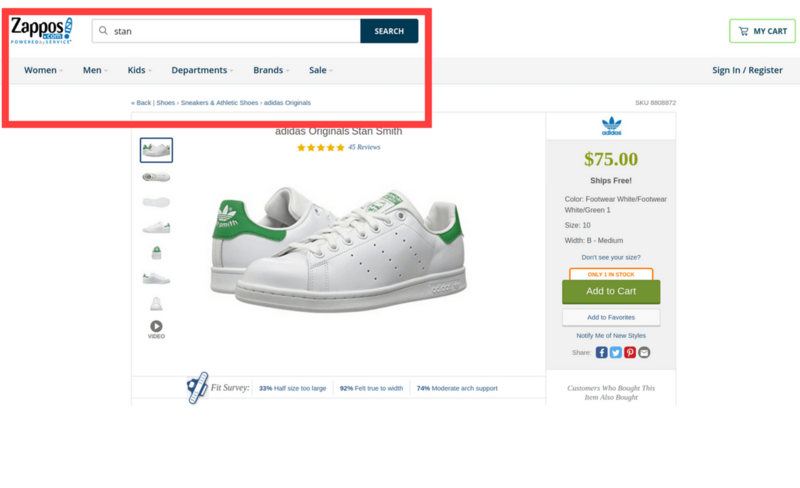 Search categories have to be relevant to the product type and reflect important visitor queries. For cloth, it can be length, colour, material, while for furniture – type of wood, number of seats etc. Presenting searching options allows customers to browse the store as they want. If they prefer to avoid navigation, the website search will ensure they find what needed. Near 70% of e-commerce traffic comes from mobile devices. So it’s important to use responsive design to optimise the website to different devices and screen sizes used by your customers. Responsive design enables the website to adopt content regardless of device size. If you build your website with CMS make sure to choose a responsive theme that will work for all devices and screens. 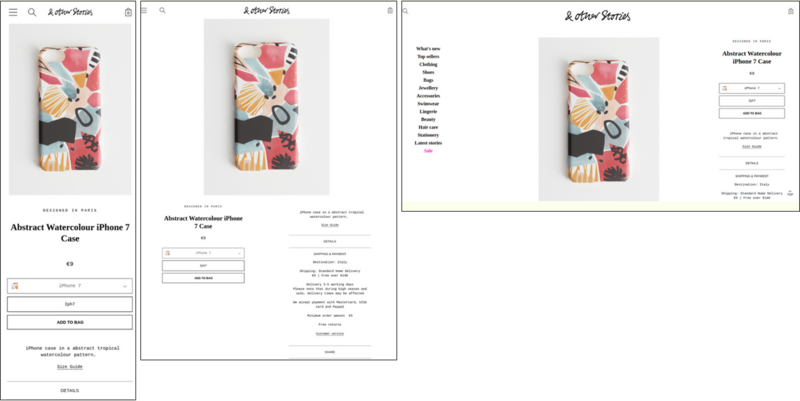 Once you apply a theme, test it on your own devices to be certain it’s truly mobile-friendly. Also, the quality of images matters. Use high-resolution pictures allowing to highlight a product in great detail regardless of the device size. 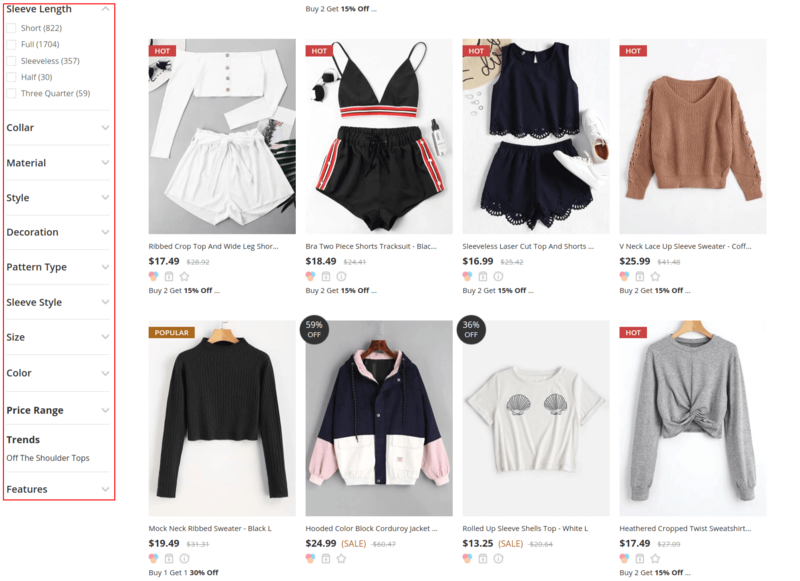 You should integrate clear product pictures into your design, whether it’s to direct shoppers to specific pages or simply to show off what you’re capable of. Online shoppers can’t stand slow websites, near 40% of them will abandon a site that loads over three seconds. Usually, people that buy online value their time, so they want online shopping to be quick. Site performance is essential for e-commerce projects. Slow online shop equal low sales. Shoppers prefer to make a purchase and forget about it, no one wants to wait to spend money. Furthermore, slow websites are annoying. To avoid losing customers, you should work on the website performance optimisation. Compress large image. Use services like Kraken.io and TinyPNG, they are free of charge. Check page loading time from time to time. Tools like PageSpeed and GTmetrix will help to keep an eye on the key indicators. 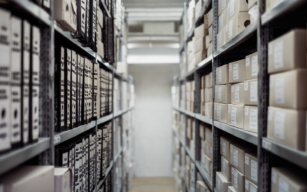 Look into content delivery networks like CloudFlare, which deliver cached versions of your store to visitors from a local server. Broken links could be critical for the online store. Having broken links on the e-commerce website can be highly annoying. When a customer is interested in something, but instead of a product page, (s)he discovers an error page, level of trust in your resource decreases. To avoid this situation, we suggest using a tool called BrokenLinksChecker. This service can prevent unwanted situations. For example, save the website indexation for the search engines, as broken links affect the SEO positions. Stick to these rules, track statistics, update pages and your store will performance will improve.